• Implémentation sur FPGA d’un réseau de neurones artificiels apprenant par conditionnements. The candidates for the competition will demonstrate their scientific and technical expertise to a panel of judges composed of many experts. The best 3 projects in both categories will receive a cash award as well as a free membership to the IEEE for one year. This year at special IEEE-CASS award will be offered. RID 2015 will also be an excellent opportunity to attend keynote presentations by three renowned speakers such as Andreas G. Andreou from John Hopkins University, Gianluca Setti from University of Ferrara in Italy, and Viktor Gruev from University of Washington. We thank all of the students who submitted their project. We invite you to visit our web site for more details. by Viktor Gruev, Washington University, U.S.A.
by Andreas G. Andreou, John Hopkins University, U.S.A.
– Dr. Massicotte from Université du Québec à Trois-Rivières offered an invited talk at the Catholic University of Leuven in Belgium. – Dr. Sawan from Polytechnique Montréal offered a keynote speech at the international conference ICABME2105 in Beyrouth, Lebanon. – Dr. Sawan from Polytechnique Montréal offered an invited talk at the International Conference on Epilepsy & Treatment in Baltimore, U.S.A.
ReSMiQ and the chapters of the IEEE Solid-State Circuits Society (SSCS) invite you to attend the following seminar to be held on October 28, 2015, at 10:00 am at Polytechnique Montréal. ReSMiQ is a group of researchers in an interuniversity research center that can count on the support of the Fonds de recherche du Québec – Nature et technologies (FRQNT) and ten (10) Quebec universities involved in microsystems research. S. K. Afshar, U. Siddique, M.Y. Mahmoud, V. Aravantinos, O. Seddiki, O. Hasan and S. Tahar: Formal Analysis of Optical Systems, Mathematics in Computer Science, Vol. 8, No. 1, Springer, May 2014, pp. 39-70. R. Narayanan, I. Seghaier, M. Zaki, and S. Tahar: Statistical Run-Time Verification of Analog Circuits in Presence of Noise and Process Variation, IEEE Transactions on Very Large Scale Integration, Vol. 21, No. 10, October 2013, pp. 1811-1822. T. Mhamdi, O. Hasan, and S. Tahar: Formalization of Measure and Lebesgue Integration for Probabilistic Analysis in HOL; ACM Transactions on Embedded Computing Systems, Vol. 12, No. 1, January 2013, pp. 13.1-13.23. O. Lahiouel, M.H. Zaki and S. Tahar: Towards Enhancing Analog Circuits Sizing Using SMT-based Techniques; Proc. IEEE/ACM Design Automation Conference (DAC’15), San Francisco, California, USA, June 2015, ACM Publications, pp. 1-6. This paper presents an adaptive state of charge (SOC) and state of health (SOH) estimation technique for lithium-ion batteries. The adaptive strategy estimates online parameters of the battery model using a Lyapunov-based adaptation law. Therefore, the adaptive observer stability is guaranteed by Lyapunov's direct method. Since no a priori knowledge of battery parameters is required, accurate estimation is still achieved, although parameters change due to aging or other factors. Unlike other estimation strategies, only battery terminal voltage and current measurements are required. Simulation and experimental results shown in Fig.1 and Fig.2 highlight the high SOC and SOH accuracy estimation of the proposed technique. Fig. 1. 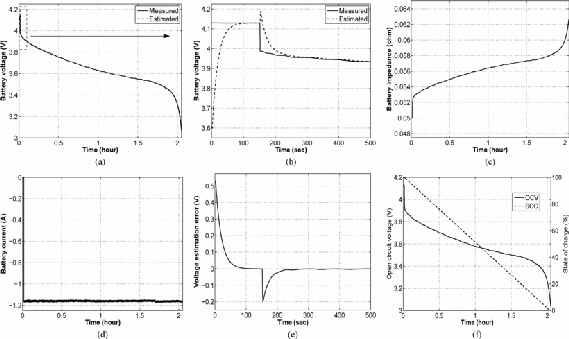 Experimental results for discharge mode: (a) and (b) battery's voltage Formula; (c) battery's impedance Formula; (d) battery's current Formula; (e) voltage estimation error Formula; and (f) OCV estimate Formula and SOC. The battery voltage tracking and error convergence to zero for both equilibrium and discharging states is shown in Fig. 1(b) and (e). The advantage behind the use of the adaptive observer is clearly shown by very good tracking performance and negligible amplitude, where the voltage error is kept in, i.e., 0.1%, within sensors' resolution. 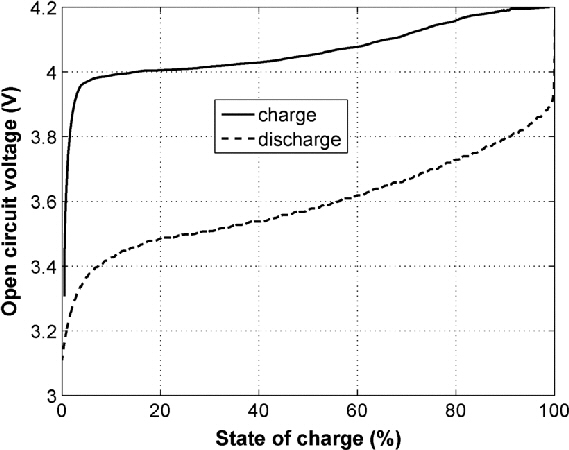 As the battery discharges, OCV decreases [Fig. 1(f)] and battery impedance increases [Fig. 4(c)]. Fig. 2. Experimental results: OCV versus SOC.